We present results from multiple comprehensive models used to simulate an aggressive mitigation scenario based on detailed results of an Integrated Assessment Model. The experiment employs ten global climate and Earth System models (GCMs and ESMs) and pioneers elements of the long-term experimental design for the forthcoming 5th Intergovernmental Panel on Climate Change assessment. Atmospheric carbon-dioxide concentrations pathways rather than carbon emissions are specified in all models, including five ESMs that contain interactive carbon cycles. Specified forcings also include minor greenhouse gas concentration pathways, ozone concentration, aerosols (via concentrations or precursor emissions) and land use change (in five models). The new aggressive mitigation scenario (E1), constructed using an integrated assessment model (IMAGE 2.4) with reduced fossil fuel use for energy production aimed at stabilizing global warming below 2 K, is studied alongside the medium-high non-mitigation scenario SRES A1B. Resulting twenty-first century global mean warming and precipitation changes for A1B are broadly consistent with previous studies. In E1 twenty-first century global warming remains below 2 K in most models, but global mean precipitation changes are higher than in A1B up to 2065 and consistently higher per degree of warming. 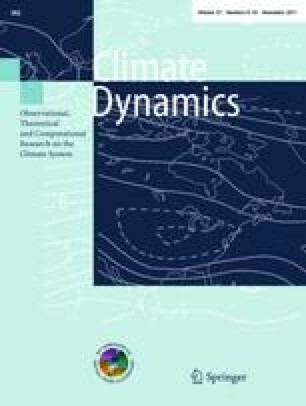 The spread in global temperature and precipitation responses is partly attributable to inter-model variations in aerosol loading and representations of aerosol-related radiative forcing effects. Our study illustrates that the benefits of mitigation will not be realised in temperature terms until several decades after emissions reductions begin, and may vary considerably between regions. A subset of the models containing integrated carbon cycles agree that land and ocean sinks remove roughly half of present day anthropogenic carbon emissions from the atmosphere, and that anthropogenic carbon emissions must decrease by at least 50% by 2050 relative to 1990, with further large reductions needed beyond that to achieve the E1 concentrations pathway. Negative allowable anthropogenic carbon emissions at and beyond 2100 cannot be ruled out for the E1 scenario. There is self-consistency between the multi-model ensemble of allowable anthropogenic carbon emissions and the E1 scenario emissions from IMAGE 2.4. We gratefully acknowledge the ENSEMBLES project, funded by the European Commission’s 6th Framework Programme (FP6) through contract GOCE-CT-2003-505539. We also thank Nathalie de Noblet, Björg Rognerud and Olivier Boucher for their help in constructing the essential scenario forcing datasets, and Jason Lowe and two anonymous reviewers for comments which helped to improve this paper. TCJ and CDH were supported by the Joint DECC and Defra Integrated Climate Programme, DECC/Defra (GA01101). The development of BCM-C was supported by the CARBOOCEAN integrated project under FP6 (grant number 511176) and the Research Council of Norway through the NorClim project. Finally we express our deep gratitude to numerous hard-working members of our respective modeling teams. Data outputs from ES2 simulations, for the historical period (20C3M) and E1 and A1B scenarios for the period 2000–2100 have been archived in CF-compliant NetCDF format in the CERA database in Hamburg (http://cera-www.dkrz.de), from where they can be downloaded for non-commercial scientific research, subject to user registration. Detailed metadata are also stored there describing the simulations and variables archived. The data include monthly mean values, daily values (daily mean, max and min, or instantaneous, depending on the variable), and also several instantaneous variables at 6- and 12-hourly resolution at the surface and on vertical pressure levels. Data files include various meteorological and oceanographic (surface or near-surface only) variables using Climate and Forecast (CF) compliant names and metadata conventions, including variables related to the interactive CC and aerosol schemes for some models and simulations that include them. For several models, ensemble simulations are included in the database. Additional variables other than those archived at CERA may be available on request direct from the associated ENSEMBLES partners or from other data centres (contact details are given in the metadata). The full multi-model dataset at CERA includes all the runs listed in Table 1, including those following the A1B-IMAGE scenario, plus some alternatively forced 20C3M runs. The total dataset exceeds 6000 simulated model years in total and is about 11 TB in size. This makes it about one third as large as the WCRP CMIP3 multi-model dataset: http://www-pcmdi.llnl.gov/ipcc/about_ipcc.php.